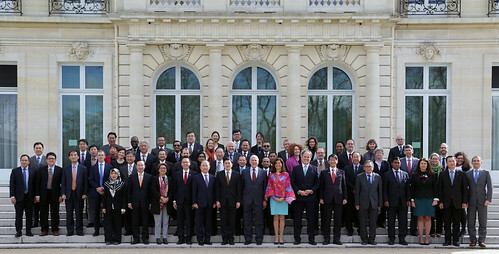 The OECD held the 2019 Forum of the Southeast Asia Regional Programme (SEARP): Connecting Southeast Asia on 11 March 2019 at the OECD Conference Centre in Paris, France. The Forum was followed by the fifth meeting of the Steering Group of the SEARP on 12 March 2019. The Forum addressed the issue of connectivity in the region under the theme of "Connecting Southeast Asia". High-level participants included the OECD Secretary-General, OECD Chief of Staff and G20 Sherpa, Ministers and Deputy Ministers from Thailand, Korea, Indonesia, Myanmar, Singapore, Viet Nam, Japan and the UK, the Executive Director of APEC and Secretary-General of BIMSTEC. The OECD also welcomed representatives from 10 Southeast Asian countries, think tanks, private sector and regional organisations, namely ASEAN, ADB, ERIA and UN-ESCAP. The meeting was co-chaired by Korea’s Deputy Minister for Economic Affairs and Thailand’s Deputy Permanent Secretary of Foreign Affairs. As outcomes of the Forum, the participants highlighted connectivity as a tool to achieve sustainable economic growth in the region. They emphasised that Institutional Connectivity is a key component to achieve effective physical and people-to-people connectivity and that such initiatives should be complementary and aligned with national economic planning. The OECD holds its Southeast Asia Regional Forum annually since 2014. It brings together policy-makers from Southeast Asia and OECD member countries, international and regional organisations, experts and business representatives to share experiences and explore common policy issues of selected thematic topics of each year forum. The meeting of the Steering Group of the OECD Southeast Asia Regional Programme usually takes place back-to-back with the Forum alongside other regional activities on specific issues such as Business network meetings and workshops.